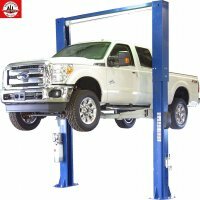 The HOLLSTEIN 9,000 lbs two post lifts are commercial grade and work well in automotive shops and hobby garages. Standard with a 220 Volt power pack for fast reliable lifting for most commercial applications. Heavy-duty leaf chains with steel pulleys do the lifting. High-strength cable equalization system and everything you'd expect from a quality lift. Standard is yellow and blue powder coat paint. 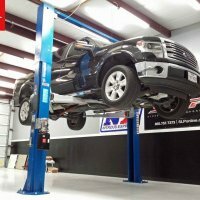 The HOLLSTEIN 9,000 lbs two post above ground lifts should be installed on a concrete floor with a minimum thickness of 4 inches and 3,000 PSI strength. 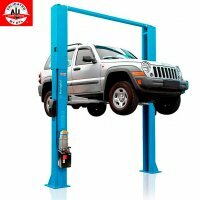 These rugged and versatile lifts are engineered and manufactured to the highest quality standards to provide years of trouble free service. Single piece column design, arm steel thickness; 6mm, column and carriage; 5mm, column dimensions; 7.25"x10.9"
Height Shut Off Bar 137-1/4"
Width Overall with Power Unit 138"